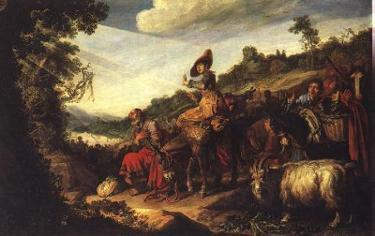 "Abraham on the Road to Canaan"
Lastman was a leading exponent of history painting and his name is linked to the most important achievements in this genre during the pre-Rembrandt period. He was also at one time Rembrandt's teacher. This painting relates to Genesis 12: 1-7. Lastman believed that a history painting should have the feel of events observed in real life. He took pains to unite the landscape and the figures in carefully rendered details.